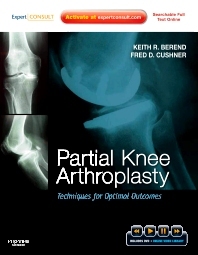 Partial Knee Arthroplasty helps you optimize outcomes using the latest best-practice techniques for this increasingly popular procedure. Drs. Keith R. Berend and Fred D. Cushner discuss recent advances and hot topics—such as custom guided implants, biologics, failed PKA, TKA conversion, and more—along with the challenges of choosing the right technique for each patient. The clear focus on surgical techniques, bulleted key points, and procedural videos on DVD and online at www.expertconsult.com make this comprehensive, practical reference ideal for learning how to achieve the best results. Access the fully searchable text online at www.expertconsult.com, along with a gallery of procedural videos. Master key techniques with videos online and on DVD that demonstrate spacer device insertion, patient selection, limited skin incision for Uni replacement, future techniques, bilateral unicompartmental arthroplasty, and more. Apply recent advances and best-practice techniques effectively thanks to global perspectives and analyses of surgical approaches. Improve patient outcomes with clear, direct, and focused coverage of surgical techniques. Find information quickly and easily with a bulleted format for convenient "at-a-glance" reference to key details and ease of use in a mobile environment.